I am not a chef, not even close. I don’t even have a love for cooking, my sister got those genes … and mad skills. Let me tell you! When I am old and gray I pray she takes me in and keeps my belly full with her amazing recipes. She is only 6 years my junior, but a girl can hope. I do like to bake, but that’s mostly because I have a sweet tooth. Unfortunately for me, my crew can’t survive on brownies and muffins. Sad times. The reality is, most days I just have to buckle down and make something real and hearty. Something that will fuel me, my hubby, and the little ones so we can continue adventuring. Basically, when it comes to meal preparation, I am merely a mom who’s role dictates that I feed everyone on a semi-regular basis. And that, my friends, is why I feed my family breakfast for dinner quite frequently. It’s the type of meal that makes everyone happy. And it’s easy. I have to try really, really hard to mess it up! I mentioned a few weeks ago that we’ve cut gluten from Jemma’s diet and that elimination plan has turned many of my staple recipes upside down. Good news is, I’ve created an even better quiche recipe for the evenings that breakfast is on the agenda. I know, send all the accolades to me for getting creative in the kitchen! 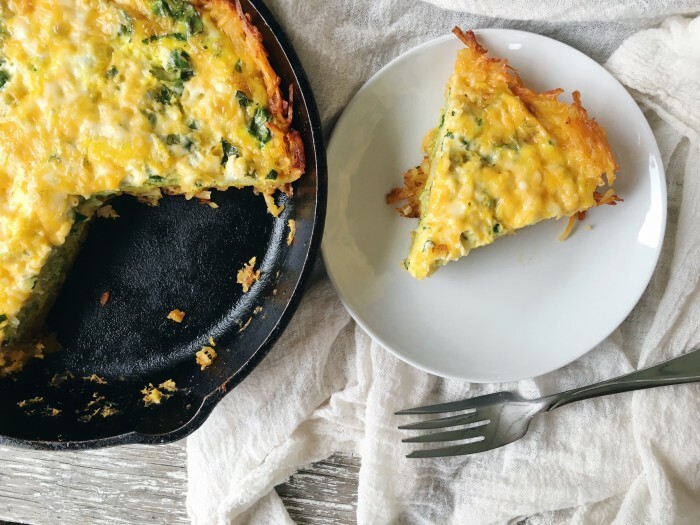 This quiche has a hashbrown crust (read: gluten-free!) and is the perfect balance of crunch and tenderness; exactly how hashbrowns should be! Plusalso, quiche is one of my favorite ways to sneak extra veggies into everyone’s meal — this recipe is jam packed and you’d really never know! Preheat your oven to 375 degrees. Follow the directions on the Hungry Jack hashbrowns (it's super simple - you just add water and let it sit for a bit!). Add your hashbrowns to a 10 inch cast iron and pan fry for 5 minutes. Gently press into a crust. Bake for 20 minutes. While your crust bakes - prep your quiche filling. Chop broccoli and steam in the microwave for 2 minutes and saute diced onions with a pat of butter until translucent. In a large mixing bowl add eggs, heavy cream, salt, and pepper - whisk well. Stir in pepper jack cheese and chopped spinach. When your crust is pre-baked, remove from the oven and layer the following: broccoli, onions, and egg mixture. Top with colby jack cheese and return to the oven. Bake for 20-30 minutes. Keep and eye on your the visible part of your crust and if it starts to brown, cover with foil for the remaining cook time. Hungry Jack has a variety of hashbrown flavors - we love the Cheesy one, but I think I may give the Black Pepper & Onion a try next! Whether you’re a gluten-free family or not, plan to whip up this quiche stat … it will be a hit with everyone! Search here to find where Hungry Jack products are sold and download a coupon before you head out! This looks amazing and you could make it for breakfast or dinner!